"Begin the journey of healing and emotional well-being." Joni Beavers, LMT, BCTMB (License number 2821) is a Nationally Board Certified and an ABMP Member. She offers Swedish massage, Deep Tissue/Therapeutic massage, as well as Hot Stone massage and Trigger Point Therapy. Massage is a great compliment to chiropractic treatment, both can be scheduled through our office for your convenience. Joni has been working with Carson Tahoe Chiropractic since 2008. 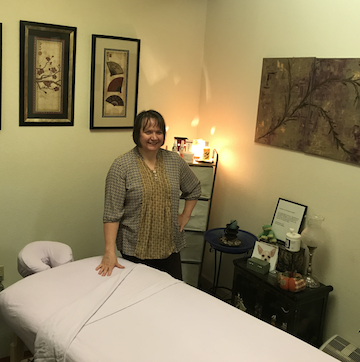 She graduated as an LMT in 2006 from Baum Healing Arts Center (now Bodhi Tree Learning Center) in Carson City and is the owner of Pure Essence Massage. Massage therapy is Joni's second career and she finds it to be very rewarding as she very much enjoys helping people to find healing and relaxation. Her goal as a Massage Therapist is to help her clients to achieve health, well-being, and relaxation by decreasing pain, reducing stress, and increasing body awareness. This can be achieved by massage therapy, nutrition, chiropractic, or a combination of these, which are all offered through our facility. The availability of these services is a great way to help her clients achieve and maintain optimum health and wellness in a caring environment.